Surrey Vets - some great runs proving there's still plenty of running in the legs! An incredibly gutsy run from Rosie Clarke in the women's 3000m steeplechase on the wettest of evenings at the Olympic Stadium, where she fell twice and yet still continued very admirably. Her run captured the eye, meaning she also then went on to feature in the BBC video montage twice (almost as much as Bolt!). We're promoted back into Division 2 of the SAL as a result of a solid team performance in Dartford, finishing 2nd but comfortably doing well enough to confirm we're going up. ​Yesterday the lady vets team retained the Southern Counties title at Ashford, winning by 10.5pts from Dartford. There were 7 teams in the final. This makes it 9 years in a row! It's getting harder tho as we are an ageing team and could do with a few baby vets esp in the running events. Still it was a great team performance - everyone played their part. Picture of Sue with the trophy below! Well done to Di Norman - European Masters Heptathlon Champion! Apologies for the lack of entries over the past few weeks - accountancy exams getting in the way! First and foremost a massive congratulations to Rosie Clarke, who has been selected to represent Great Britain (3000m s/c) at the upcoming World Championships in London next month. Belated well done to the supreme Di Norman on an astonishing haul of 8 gold's at the British Master's Championships last weekend! 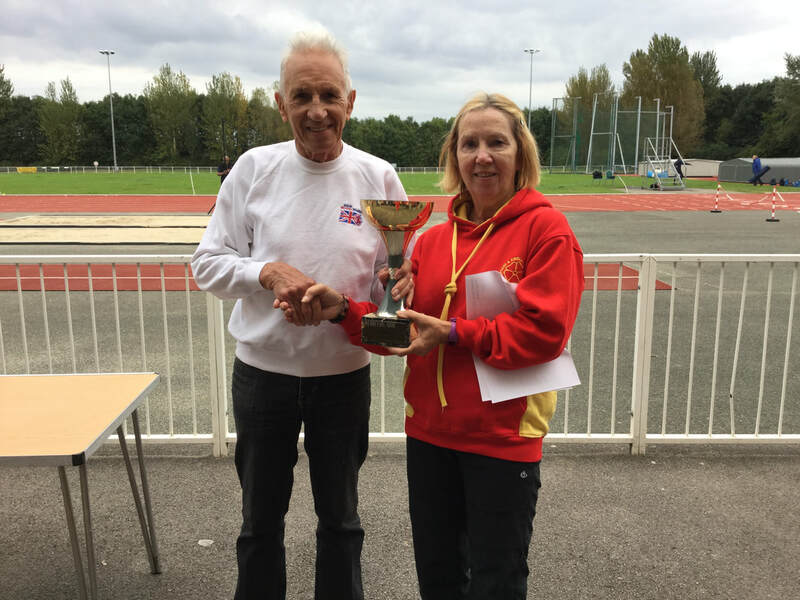 A busy weekend for the Harriers with Southern League on the Saturday followed by the Richmond 10k (including the Surrey Championships) on the Sunday as well as the British Masters Pentathlon Champs. Southern League, Kingsmeadow: https://www.southernathletics.org.uk/2017_division3se.html - results in the fullness of time will appear here. However importantly we made in 3 wins from 3 meaning we're in a very good place to contend for promotion in the final 2 rounds. Well done in particular to Izzy Brinsden in winning the Surrey Championships, with Ollie Garrod coming 3rd on the men's side. Marion and Sue won their respective vets categories with Dave coming 2nd in his! A busy week for the Harriers with 2 races midweek. A belated congratulations to Alastair Bloore who completed 7 marathons in 7 days (finishing on 19th June in the mist of our latest heatwave!) an incredible achievement - well done! Different venue, different teams but the same old result! Wins across the board with the Senior Men, Vets Men, Senior Women teams and individual Senior Man (Ryan Griffith and Phil Mackie), Senior Woman (Alice Germana) and Junior Man (Alex Gurteen). Great effort all! Despite this being 1 day after the 26.2 relays we managed to fill nearly all the races/events. Women are sitting pretty at the top of the table but our men are languishing a little bit despite best efforts. The next one of these is "back at our place" in Ewell, so please do put it in your diary.